The Los Milagros Hotel in Cabo San Lucas is a hotel that gives you a lot more than what to nightly rate suggests. 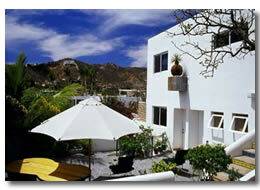 This is perfect if you're on a budget, and not bothered about a Cabo hotel in town. If you like the Cabo San Lucas nightlife you'll be staying right on it's doorstep. Sandra the manageress is a lovely lady. She likes to read, and has an extensive collection of books that she shares with the guests. Any trouble with anything, and Sandra will do her best to help you. The Los Milagros only has 12 rooms, and it seems these smaller Boutique hotels as they are called, do seem to have a much better service. And you hear that off of a lot of other guests as well. You'll be two blocks away from Cabo Wabo and the Giggling Marlin when you stay at this hotel. These are two of the most popular bars in Cabo San Lucas. So if you have too much Tequila you don't have far to walk back to your hotel. You're a few blocks from the marina as well where you'll find some nice restaurants like Baja Cantina. If you're on a budget you can buy your groceries, and cook them in your kitchenette back at the Los Milagros. 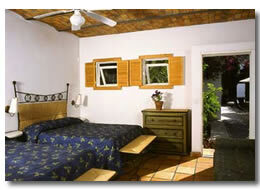 The bedrooms are smaller than what you find at the bigger resorts but the beds are a lot more comfortable. Hotels in Cabo San Lucas are well known for their beds being on the firmer side but the beds here are ok. The cost of the rooms start at $75 a night, and that is a fraction of the cost of other hotels, and resorts. The pool is a perfect place for a dip after a day out on an activity or around town. Then you can go up to your room, and relax on the terrace. Being a couple of blocks from the nightlife is a blessing if you're had a busy day. There's no need for cabs or any driving. You just walk up the road have a few drinks or more, and then stroll back to the Los Milagros. 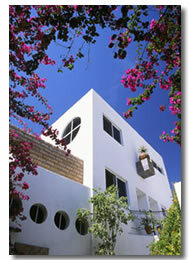 The Los Milagros hotel is a small oasis in the heart of Cabo San Lucas. You won't beat this hotel if you're on a budget. The prices are excellent, and so is the service.